Brownies have so much going for them; great flavor, easy to make, and so versatile. The simplest brownies are made with just melted chocolate, butter, sugar, eggs, vanilla, and flour. Delicious, of course, but you can also take a brownie to the next level by adding a layer of frosting. And that is what we do with these Chocolate Brownies. We start with a brownie that has a deep chocolate flavor and a dense fudge-like texture and top it with a smooth and glossy Chocolate Ganache. This transforms it into a dessert so good that I am not sure whether we should call it a square or a candy. Brownies can be made with cocoa powder, semi sweet chocolate, or unsweetened chocolate. Each will make a brownie with its own unique flavor and texture. These Chocolate Brownies use unsweetened chocolate which gives them an intense chocolate flavor as unsweetened chocolate is chocolate in its rawest form and is just ground cocoa nibs that have been refined and contain between 50-55% cocoa butter (cocao fat). They are very similar to the Katherine Hepburn Brownies only they contain more flour and double the amount of unsweetened chocolate which gives them a more fudge-like texture and an even stronger chocolate flavor. Again, as with most brownies, they are simply made using one bowl and are done when a toothpick inserted into the center comes out with has just a few moist crumbs. 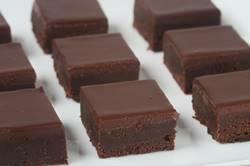 Once the brownies have completely cooled, they are frosted with a Chocolate Ganache. Ganache is a mixture of cream, butter, and semi sweet chocolate and is wonderfully smooth and creamy with a glossy texture. I like to store these brownies in the refrigerator which makes them all the more fudgy. Serve them cold or at room temperature. Chocolate Brownies: Preheat oven to 325 degrees F (165 degrees C) and place rack in center of oven. Line the bottom and sides of an 8 inch (20 cm) square baking pan with foil. Melt the chocolate and butter in a heatproof bowl (I prefer stainless steel) placed over a saucepan of simmering water. Remove from heat and whisk (or stir) in the sugar. Next, whisk in the vanilla extract and eggs, one at a time, beating well after each addition. Finally, stir in the flour and salt. Pour into the prepared pan and bake for about 22 to 25 minutes, or until a toothpick inserted into the center comes out with a few moist crumbs. Remove from oven, place on a wire rack, and let cool to room temperature. Chocolate Ganache: Place the chopped chocolate in a medium sized heatproof bowl. Set aside. Heat the cream and butter in a small saucepan over medium heat. (Can also heat the cream and butter in the microwave.) Bring just to a boil. Immediately pour the boiling cream over the chocolate and allow to stand, without stirring, for a few minutes. Stir gently (as you do not want to incorporate air into the ganache) with a spoon or whisk until smooth. Let cool slightly and then spread the ganache over the brownies. Place in the refrigerator to chill until firm (a couple of hours). Then cut into squares. I like to store these brownies in the refrigerator. They can also be frozen.